impacts the strength of the emotional connection almost as much as the content itself does. As part of the POPSUGAR Insights/ulive 2014 lifestyle video study, we asked women to share the reasons why women prefer to watch online lifestyle videos on certain sites and not on others. Overall, women prefer sites that they consider to be user friendly (46%), that make it easy to find related videos (32%), and that offer fast loading times (30%). 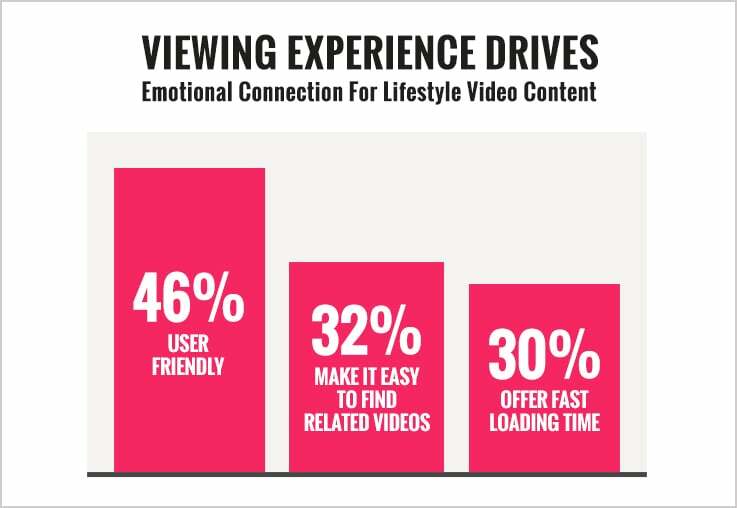 Having professional or high-quality video content and offering videos that load quickly are more important to heavy lifestyle video consumers (women who stream over 240 minutes per month) than women overall. Additionally, women enjoy sites that seem to be "genuinely trying to share or teach me something," rather than sites that are obviously pandering to an audience or offering click bait. Women are actively seeking engaging, positive, meaningful, and sometimes funny content, not tricks, and publishers who provide that authentic connection are valued. Comedy sites were frequently mentioned as sites that women enjoy. Sites that women actively dislike also include those that "eat up processing power" to just load the page or "load lots of ads." Younger women between the ages of 18 and 24 are more likely to prefer sites that make it easy to discover related and interesting lifestyle videos after having watched a video (41%). They are also more likely to prefer sites that know their individual tastes and make relevant recommendations (34%). More than women overall, younger consumers are also more likely to feel that professional videos or videos with a high production quality are more important (34%).